InstaGC is a website where you can earn points by completing various types of tasks to which you might already be familiar with, like Completing offers, surveys, tasks, watching videos and more. InstaGC (for Instant Gift Card) has been around since 2011 and most reviews rate it as a legit site to earn some money. So it is safe to say that InstaGC is legit. The registration process takes a bit longer than most GPT sites. And after sign up, you’ll also need to link your PayPal account to start earning. 2. Fill out the information in the sign-up form as shown below (or sign up using google+, Facebook or Twitter.) and click "Sign up and get 10 free points". 3. After that fill the text boxes under ‘Personal Contact Information’ and select Blog, Social media or any of the options from the “how did you find us” drop-down box. 4. Now you need to link your PayPal account to InstaGC. click the “Link verified Paypal” button. 5. PayPal.com will open. 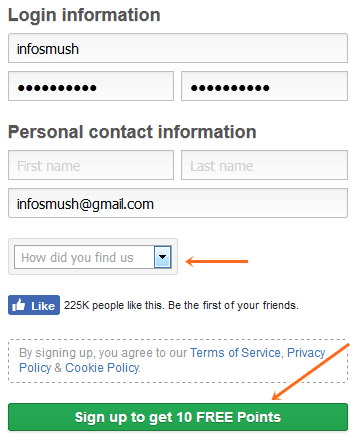 Login to your account and click Agree. 6. A verification email has been sent to the email address that you entered in the first step. Click the link in the email the verify your email. 7. Now you can start earning money with InstaGC. There are many ways to earn from this site. Although InstaGC is available in all the countries most of the earning opportunities are geo-targeted so you might get fewer tasks or less pay for the same task depending on your country. Generally, users from more developed countries get higher paying and more earning opportunities. In this section, you can earn points by installing apps on your mobile. However, some apps need you to follow further instructions to get your points and usually pay more. For example; some app-offers may require you to make an in-app purchase or reach a certain level. To complete these offers click on the offer and enter your email address. Then click the link in the email and install the app and follow the instructions. This is one of the easiest ways to make money with InstaGC. 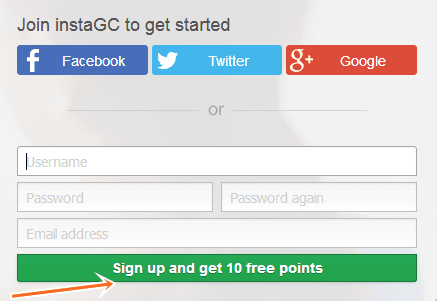 With InstaGC’s search the web feature you can earn points for what you already do. It’s the same as Swagbucks’ search but Swagbucks search is simply yahoo search results with sponsored content from SB. So, in that department Swagbucks has InstaGC beat. Actually, Swagbucks is better than InstaGC. And like Swagbucks, ‘InstaGC search the web’ isn’t available for all the countries. It is only available in the select few countries including US, UK, Australia, and Canada. Click results that you're interested in. In other words, use this like any other search engine. Abusing the search will result in ban. Surveys are a great way to earn points on InstaGC. But most of the time before the actual survey you need to take a ‘qualification’ survey. And even then there’s no guarantee that you won’t be kicked out in the middle because the survey ‘’wasn’t for you’’. This is the part that annoys me the most. If I’m being disqualified at least give me some damn compensation for the time I spent. But they just get away with a ‘’sorry’’. Another way to earn some points without any effort. But that also means you’ll earn very less. Less than a penny per video. You can earn 1 penny for 3-10 videos. Before each video, an ad is played and each video is a couple minute long so it’s gonna take a while before you even earn 1 point. You can enter into Decimal pot by depositing fraction points or decimal points. For example, if you have 190.67 points you can deposit .67 to the decimal pot and stand a chance to win big. Since only decimals are deposited you are not risking too much. The system randomly selects 3 winners and split the prize pot as follows:1st prize = 50%, 2nd prize = 35%, 3rd prize = 15%. Here you can win points by predicting the winner of a match and total score. Use your own points to enter by clicking Enter for the day/week that is in Open status. Once your entry is created, simply make a selection for each game and a tiebreaker score prior to the deadline in order to be fully entered. Please note that only one entry per member per day/week is allowed. All contest entries must be submitted by the time the first game for that day/week starts. No entries will be accepted after that time and no refunds will be awarded for incomplete or late entries. In the case where more than one member makes the exact same selections, a tiebreaker will be used. The actual tiebreaker will be the exact amount of the final score of all games combined for the specific day/week. When making your picks, you will need to take a guess as to what you think it will be. If members have the exact same selections and tiebreaker, the member who entered first will be the winner. The winners of each day/week will be those members who have the highest score which is achieved by picking the most games correct. In the event of a tie, your tiebreaker guess will be used to determine the winners. The three members with the best scores will split prize pot (1st place = 50%, 2nd place = 35%, 3rd place = 15%). You can also redeem point booster codes that are published on the social media pages of InstaGC. You can enter these codes on the Redeem Point-Booster Codes page and earn a few points. This pretty much works like PrizeRebel except the fact that to be able to redeem these codes you or one of your referrals must receive credit for at least one task in the past 5 days in order to redeem a point booster code. You can also create your own point booster codes and choose the amount of points that will be given per use and the number of times the code can be used. Offers are the main way to earn with any GPT site and InstaGC is no exception. There are many offer providers that pay you for signing up, shopping, playing games etc. There are also some offers that require you to buy something or need your credit/debit card information. Don’t attempt these offers unless you trust the site where you’re making the payment and you need the item or service. For every friend that signs up through your referral link, you both get 10 Points. And you’ll also earn 10% of their earnings forever. Earnings do not include bonuses(sign up bonus, promo code,etc.). You will only receive 10 points for the sign up of those referrals that are from these countries: United States, United Kingdom, Australia, and Canada. However, all your referrals will get the sign-up bonus, no matter their geographical region. Like I said at the beginning of this review, InstaGC is available for all countries, So it has different gift cards for every country. You can redeem your points for gift cards like Amazon, Steam,1-800-Flowers.com, Apple Store and much more. You can also redeem your points for cash through PayPal. The minimum amount that you can redeem is $1=100 points. For PayPal withdrawals, a fee of 20 percent of the amount redeemed is charged but the first withdrawal is free of charge. instaGC is a great way to earn a few bucks every month by completing simple tasks and surveys. And if you are from US, UK, Australia or Canada you could earn more. But remember you won’t earn a substantial amount from these sites. Sites like InstaGC are only good for extra income, not income. It would have been great to have an app too but unfortunately, InstaGC does not have its app yet.